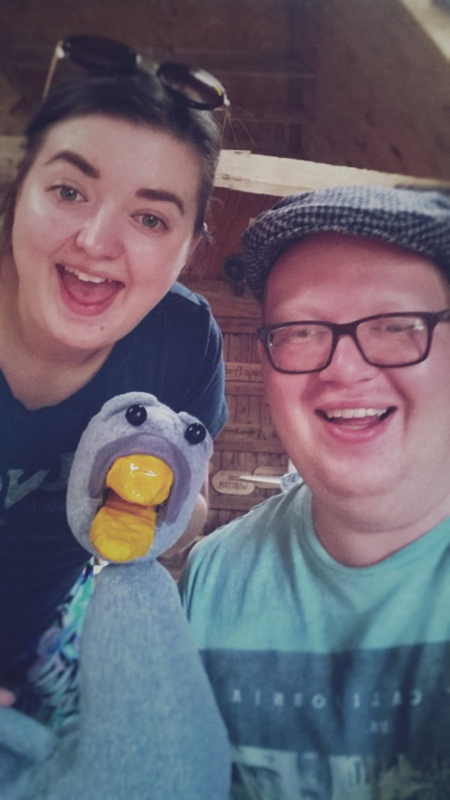 What a fantastic summer we have been having here at Above Bounds, as our Ugly Duckling has been waddling his way across the UK on our first UK tour of our work! 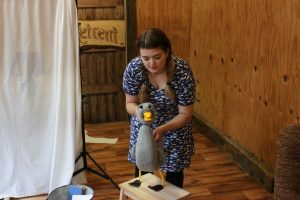 Thanks to support from the National Lottery through Arts Council England, Exeter City Council and Kingsteignton Town Council, we have been taking our show ‘The Ugly Duckling & Other Tales’ and workshop to some fantastic venues across the UK. 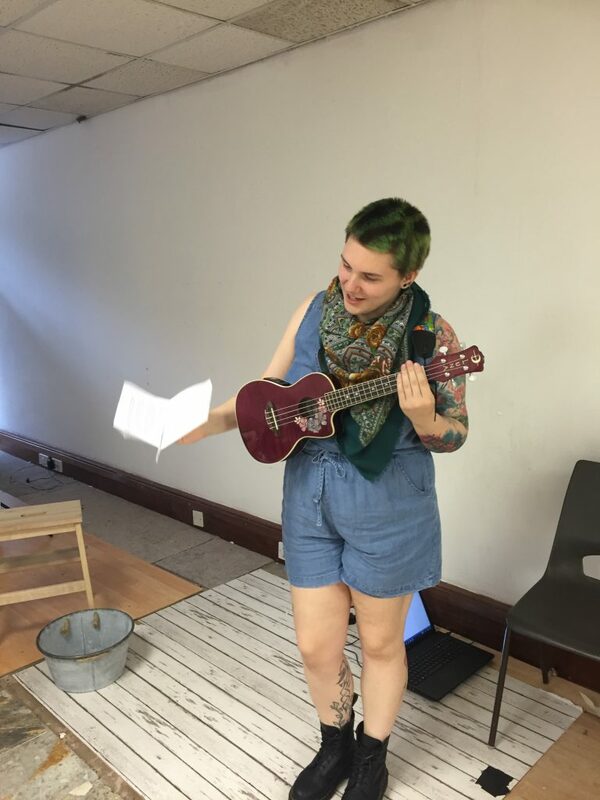 We began back in July, after a week of R&D at the Bike Shed Theatre’s Unit Space, working with Becky Dobson, a fantastic addition to the Above Bounds Team playing Emily Snee’s music. 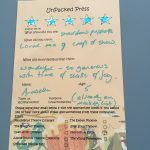 Our first performance with performance at Midsummer Dreams Festival at Dartington Hall, a fabulous children’s theatre festival set in the gorgeous estate. The performance was really well attended and we were ready to hit the road. 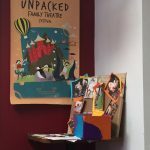 Next stop was the Unpacked Children’s Theatre Festival at the Exeter Phoenix, curated by Paddleboat Theatre. Here, we received our BRAND NEW set by Nina Raines and we were so excited to start working with it. Both of our shows were SOLD OUT and we were so pleased to return to the festival (you might remember we previewed our shadow puppetry workshops at the festival last summer). After a fantastic festival, it was off to Suffolk with 2 shows and a workshop at The Seagull Theatre in Lowestoft. 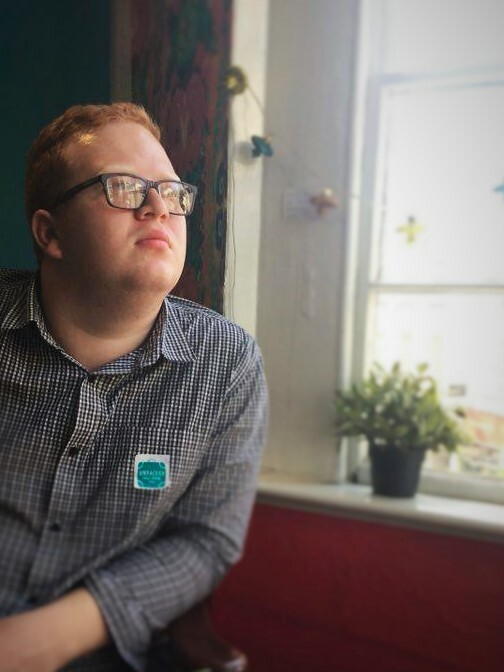 George’s family live in Lowestoft and as a company, we are keen to make connections in both the East and West. This was our first performance in the South East and it was a lovely one. 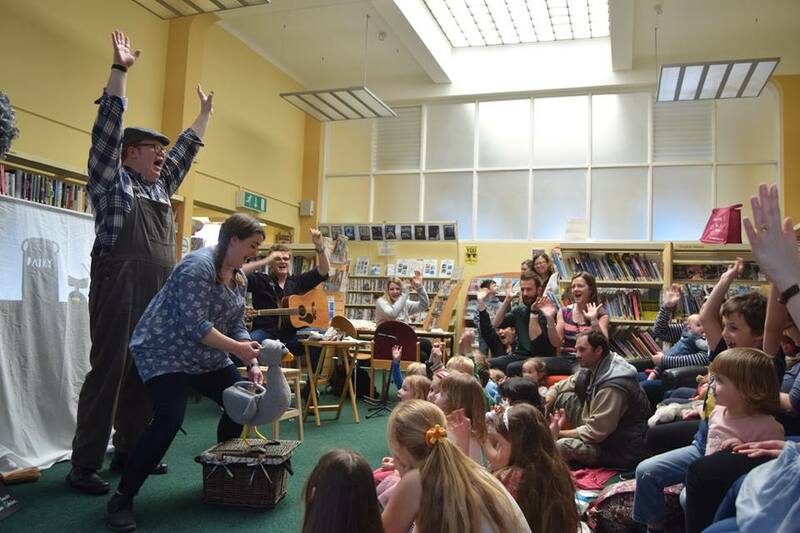 Our audiences loved meeting our Ugly Duckling and singing along to the music. We also had a Company trip to the beach- a must when visiting Lowestoft. Upon returning from Lowestoft, we ran a series of workshops supported by Exeter City Council and taking place at Exeter Libraries. 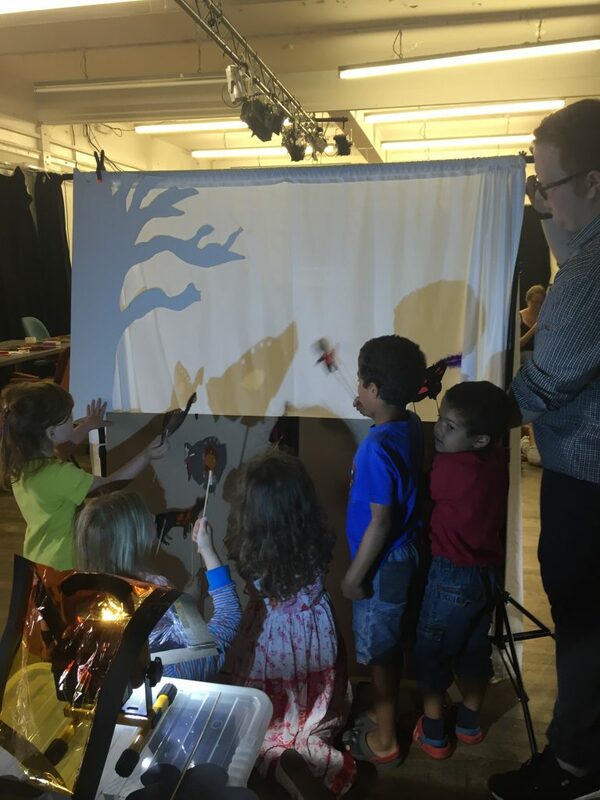 We visited Exeter Central Library, Pinhoe Library and St Thomas Library, engaging with local residents and encouraging little ones (and big ones) alike to make shadow puppets. We have been so inspired by these workshops, often the participants make better puppets than ours! We are hoping to return to the Libraries at Christmas, so keep a look out for more information soon! Next up, we are at the Tacchi-Morris on Saturday 16th September, Crediton Arts Centre on Saturday 23rd September, Tiverton Community Arts Theatre on Saturday 30th September and Victoria Hall Radstock on Sunday 8th October. Tickets are on sale NOW take a look and buy yours now- tickets available via the link on our homepage. We’ll be back with another blog soon! Please do share your photos from the show with us, we love to see them. Wow, our Ugly Duckling has certainly developed since we began devising the piece in August 2015. Before we take our Ugly Duckling on tour this summer, let’s look back on how far we’ve come over the last year. Firstly, we completed a successful R&D of the project last summer using public funding from the National Lottery through Arts Council England and working with Clare Willcocks to illustrate our artwork, and India Isaac, Brixington Primary School, Sam Worboys, Emily Snee and the Bike Shed to develop the piece. Then we worked with Luke Jeffery to create our fabulous trailer! 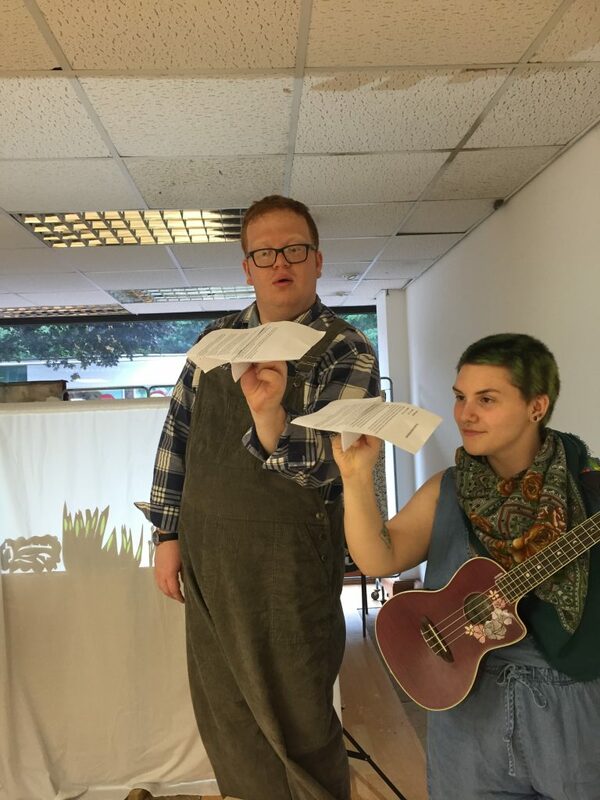 After one week on the Theatre Farm Retreat in Suffolk, and one week at the Bike shed Unit Space in Exeter, we’d made the piece, which we performed at Exmouth Library to an excited crowd. From here, we took the piece to Outpost festival at the Royal William Yard in Plymouth. Being part of this Pop-Up theatre was an amazing experience and we played the show to 2 fabulous audiences. With a little bit of redevelopment, the piece has then gone on to tour to the From Devon with Love Festival at the Bike Shed Theatre in January, the Doorstep Arts Festival in Torbay at Easter and the Brighton Fringe 2017, where we performed 5 shows in the Warren: Studio 3! Thanks go out to our fabulous composer Emily Snee, and our stand-in musician John Archer who helped us out for our performances in Torbay. Photo by Doorstep Arts, April 2017. We are now excited to announce that our Summer 2017 has been supported using public funding by the National Lottery through Arts Council England, Exeter City Council and Kingsteignton Town Council, with project partnership from Worboys Productions and the Bike Shed Theatre. With their help, we are taking our Duckling on the road all across the South West (and even Suffolk!) We’ll be performing in Dartington, Exeter, Lowestoft, Falmouth, Torrington, Taunton, Crediton, Tiverton and Radstock! You can view our full tour dates and buy tickets HERE! 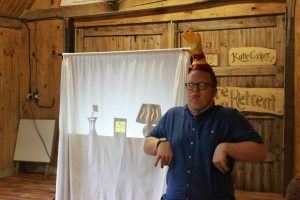 We can’t wait for you to meet our Ugly Duck, watch the piece and even have a go at making your own Shadow Puppets with our Library Tour in collaboration with Exeter Libraries. So, as George and I look back on the last year, we can certainly say it’s been a good one! Thanks so much for all of your support and we look forward to welcoming you along to the show soon! First up is Midsummer Dreams Festival on July 23rd. Our show is on at 11.30am and you can make your own shadow puppet from 10.30am- see you there! You may have noticed that we haven’t posted for a while because we have a brand new website (thanks to Luke over at Wandering Tiger Productions) we hope you like it! 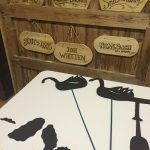 Since our development in the summer, we put our Ugly Duckling to rest for a few weeks before performing at New Model Theatre’s Outpost Season of Pop-Up work at the Royal William Yard in Plymouth. We performed on Saturday 29th and Sunday 30th October as part of the family programme. The festival is fantastic, taking place over three weeks in October in Ocean Studios at the historic Royal William Yard and bringing work from all over the Country down to Devon. This year, there was also a special twist, with an Outpost REP company performing three different pieces across the festival- an Ibsen, Mark Ravenhill and a new play written by Artistic Director Tom Nicholas. Last year, I volunteered as part of the festival and it was such a lovely experience to bring the Ugly Duckling there this year. We were so pleased to see how well received the piece was, as we are hoping to still develop it for two further weeks next year. We had a brilliant turn out, so thank you so much for coming along! Next up is Travellers’ Tales at St Anne’s Arts Centre in Barnstaple on Sunday November 27th. Tickets are now available via the North Devon Theatres Website. We hope to see you there! 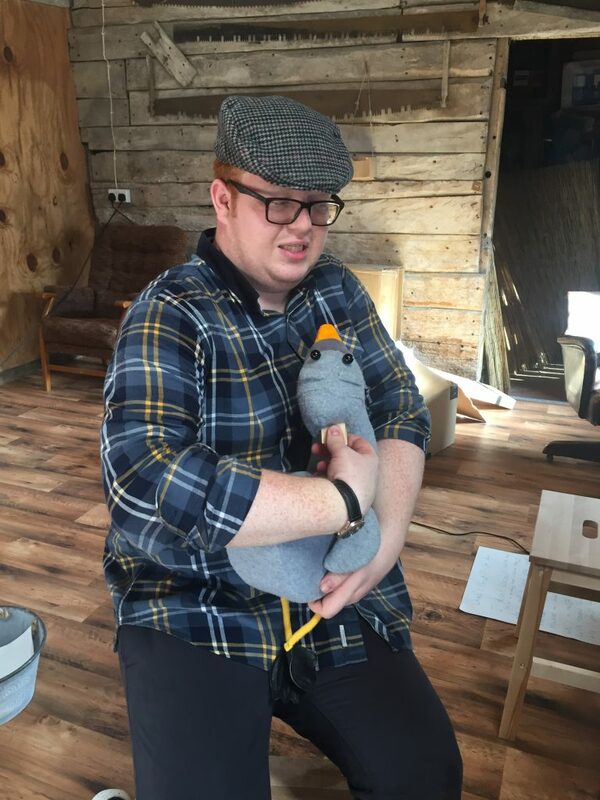 We’re winding down the R&D of Ugly Duckling & Other Tales now, and so it is time to reflect on how far we have come in the last few weeks and what the future holds for the project. 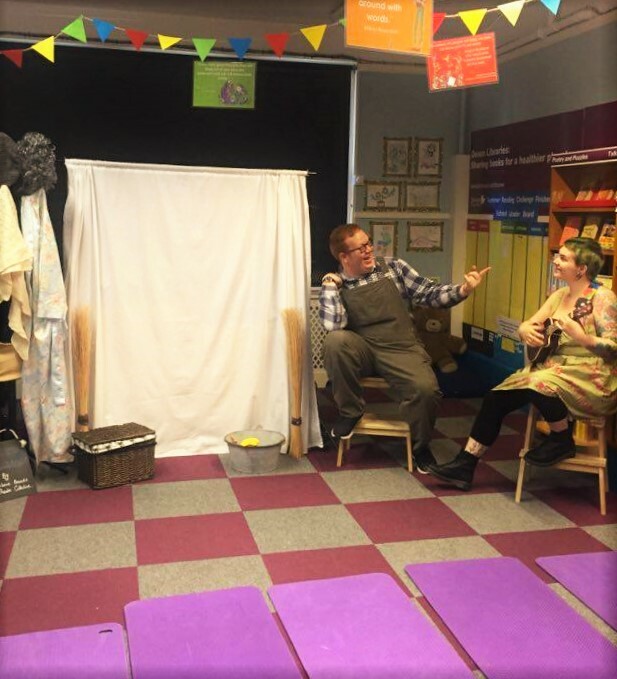 Yesterday saw the essential culmination of this phase of development with a performance of our show given at Exmouth Library to a receptive and enthusiastic audience in the children’s section. This was our first opportunity to perform the whole piece as it stands to our target age group and so we were excited, though at least a little nervous to see how it would go. We had spent much of the development process trying to make sure that the storytelling was clear, that the piece as a whole would engage and resonant with our target age group, and that it would stretch the linguistic and emotional skills of our audience. I’m glad to say that we have at the very least achieved those aims. 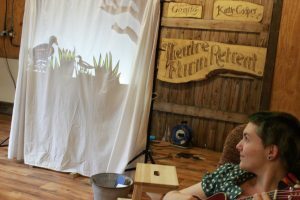 The audience in Exmouth loved the telling of the story through shadow puppets and a host of imaginative characters on stage. The themes of body image, identity and self-confidence also seemed to resonate well with the young audience and their parents were equally moved by the tragic, rebirth narrative which we highlighted in our show. It was a pleasure to perform there and a perfect way to end this phase of work. However, this is not the time to sit back and congratulate oneself. Oh no! There is much work still to be done. In the coming days, weeks and months we will be seeking to further refine and interrogate the material we have come up with and think of evermore imaginative ways to engage and interact with our audience. We will the planning he next phase of development and of course booking in performances. And above all else, I think we owe it to ourselves to take a leaf out of the Ugly Duckling’s book and live our own truths, proud of who we are, accepting of our faults, and wholly unprejudiced in our experience of life. We had a busy final day in the Bike Shed Unit space performing our work in progress showing of ‘The Ugly Duckling & Other Tales’. The showing was very well received and we are really pleased with what we have created over the last two weeks. 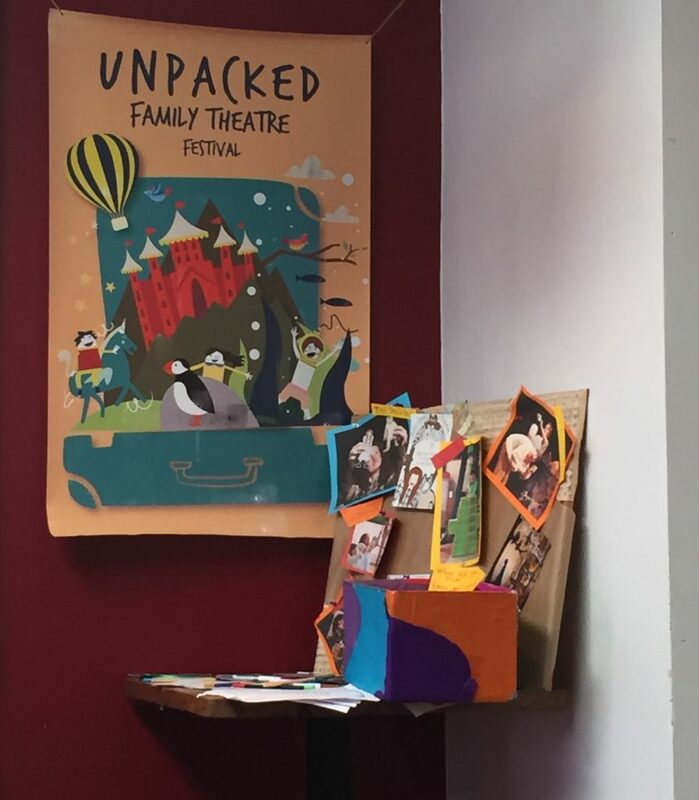 After some feedback and filming of our work, we packed up from the Unit Space and prepared for our shadow puppetry workshop as part of the Unpacked Children’s Theatre Festival in Exeter (which was today). 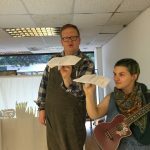 This festival is a new children’s theatre festival in Exeter, in collaboration with the Bike Shed Theatre, the Exeter Phoenix and Paddleboat Theatre Company. We were chuffed to be asked to hold a workshop as part of the festival and decided we would include it into our development process. Today was a great chance for us to show a short preview of our work to our target audience and it was great to see how well-received it was. It was also great to try out our workshop, which we would love to offer to theatres as an option alongside performances. We have been developing an education pack since our workshops with Brixington School in Exmouth. The children in our workshop today were fantastic budding performers and puppeteers who made some brilliant puppets! It was great to see their puppets come to life on the screen and to see how much they enjoyed the process. Another highly successful day working at The Bike Shed Theatre’s Unit Space in Exeter. Today we recapped the work we began yesterday and completed two full runs of the piece, ironing out any sections which weren’t as clear as they could be. This included working on the Emperor’s New Clothes song which we developed yesterday. This is another fun, upbeat song which we feel will appeal to our target audience especially. We finished the day performing to Chloe Whipple from the Bike Shed Theatre. It’s been so useful to have feedback throughout the process as we’ve been able to constantly clarify and improve our work. Chloe gave us some really useful and specific notes which we will work on tomorrow morning before our showing at 2.30pm. 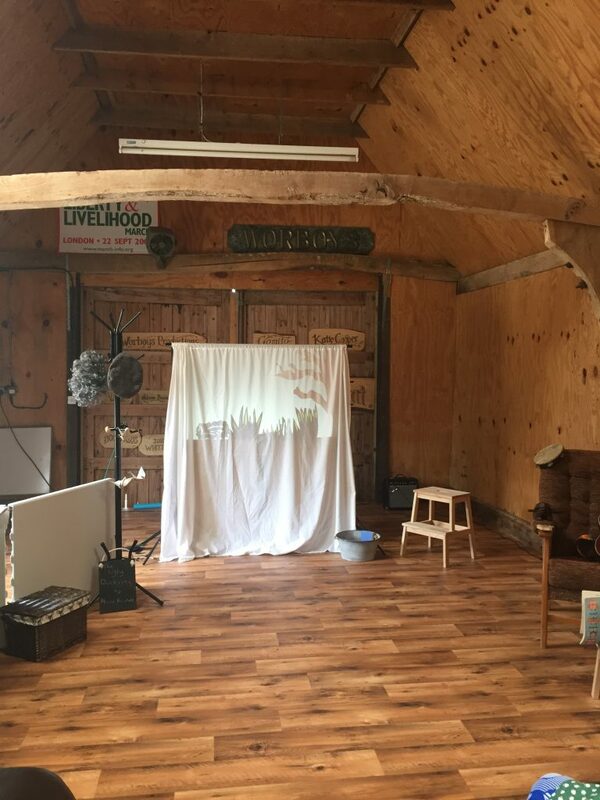 Here are some of the pictures from last week’s development up in Suffolk on the Worboys Productions theatre Farm Retreat- we hope you’re enjoying reading about our process and we look forward to updating you on our showing tomorrow evening! 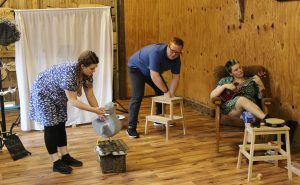 Since creating work at the Worboys Productions Theatre Farm Retreat we’ve been developing ‘Ugly Duckling & Other Tales’ at the Bike Shed Theatre’s Unit Space in Exeter. We had a lot to think about after the feedback we received on the farm and we got straight to work. On Saturday we reworked on the opening section of the show and then presented our work to Emily Souter Johnson, The Bike Shed’s Framework Producer who gave us some great ideas for how to make the piece even more relevant for young audiences. It’s been fantastic to work with Emily at the Bike Shed to receive feedback on our work and support as artists to develop new work, with freedom to experiment without fear of failure. Today we’ve been consolidating the feedback we’ve received and checking-in with how the current show relates to our original aims for the project. We’ve been experimenting with the use of technology to make a more specific reference to the effects of Instagram culture on young people’s body image and the ever-growing threat of cyber-bullying. This involved us using mobile phones during the ‘Wild Birds’ scene, which added a lovely effect to the scene and really brings it up to date. We’ve also been working on the overall look of the piece to bring a more coherent image to the world we’re presenting. George now has a fantastic costume (a very dashing dungarees) and Emily and I are experimenting with wearing denim, which adds to the farm-yard image of the piece. We’ll be showing our work-in-progress at the Unit on South Street in Exeter on Wednesday at 2.30pm. Please do send us a message if you’re free and we hope to see many of you there! Alas! Already our time on the Worboys Productions Theatre Farm Retreat draws to a close, but the last few days have been super productive! We spent the day time devising new material, Emily composing songs based on our given brief and George and I improvising and devising scenes based on the original Hans Christian Anderson text. Once we’d come up with an idea that we thought might work, we would then write this into the poem and decide which sections would be in rhyme and which would be in narration. When we’d devised a scene, we’d then come back together with Emily and put the music to the on-stage action, working out where best to have the music. We followed this process until we reached the end of the story, then we started the task of connecting all of the scenes we had made together. This was a tricky task, as some of the scene changes, especially with regard to the puppetry, were complicated. After several hours smoothing out the knots, we’d come up with a good system, and what felt like a piece! We got to work rehearsing the material in preparation for our first work in progress showing, which was today. It was really useful for us to have an outside eye during the work in progress showing and to receive some feedback on the project. The response was really positive, which was lovely to hear and encouraging for the week of devising ahead. The most difficult thing George and I have found during the process is who we are as storytellers and now we fit into the overall framework. There were suggestions for all three of us to interact together more and this is something we will start to do on Saturday in the Bike Shed space. 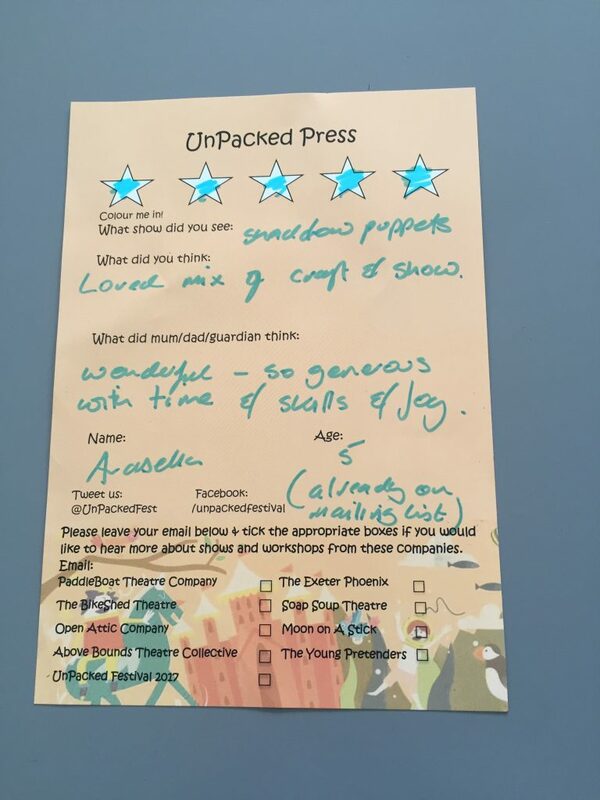 It was lovely to hear that the puppets played well and were liked by the audience. Also the amount of different types of puppetry that feature in the show were well received, with many of the scene changes noted as smooth (all the hard work paid off there). So where do we go from here? We will access in detail all of the notes given and try to find solutions to some of the problems we have encountered. We will work on character in more depth and hone in on some of our puppetry skills. After a productive and positive start, we are so excited for the week ahead. 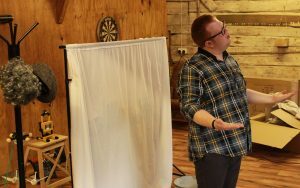 Massive thanks go to Sam Worboys and the Worboys Productions Theatre Farm Retreat for having us back to develop our work. It really is a brilliant place to focus without distraction, surrounded by gorgeous countryside. 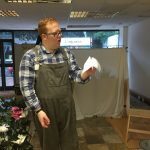 The Ugly Duckling & Other Tales R&D is a project supported by the National Lottery through Arts Council England, with project partnership from Worboys Productions and the Bike Shed Theatre, Exeter. Two more days at the Farm! I must first apologise for the lack of a post yesterday; it can be a bit hit and miss with the signal here in rural Suffolk- but it’s perfect atmosphere for us to devise without distraction. Our musician Emily arrived yesterday and we had such a great first day working with her in the rehearsal room. Straight away, the work we had made came to life with the addition of music, especially the shadow puppetry sections. 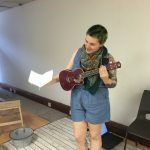 Working with her Ukele we set Emily the task of creating some songs using some of our text. The result was something we can’t wait to show you! 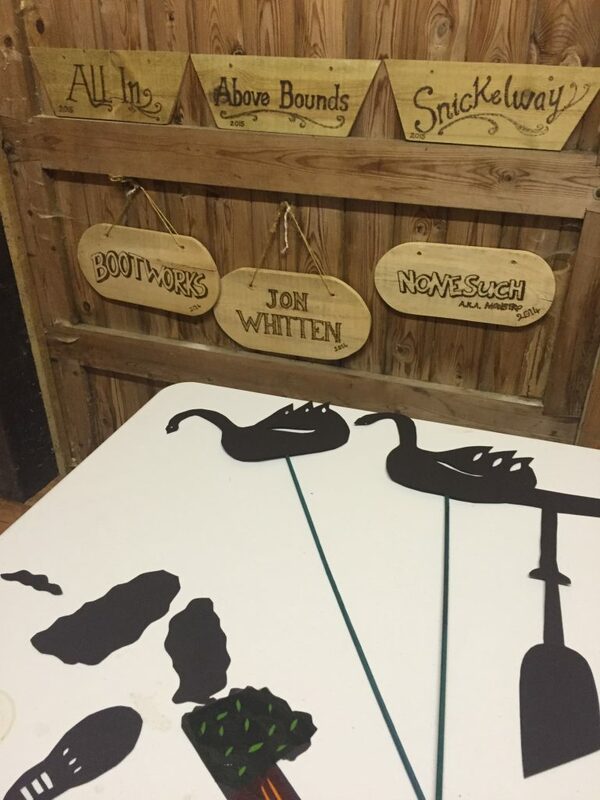 We managed to create scenes up until our ‘ugly’ duckling meets some wild ducks. we had a really productive day and planned the following days activities. The format of today was similar to yesterday- we woke up and after a brief warm-up we progressed with devising the story. We developed songs from the previous day and then worked together to create new movement sequences. 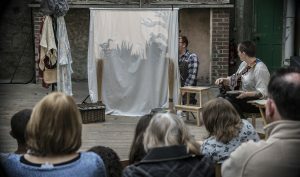 The scene with the wild ducks was created using a mixture of sound and puppetry and worked particularly well. 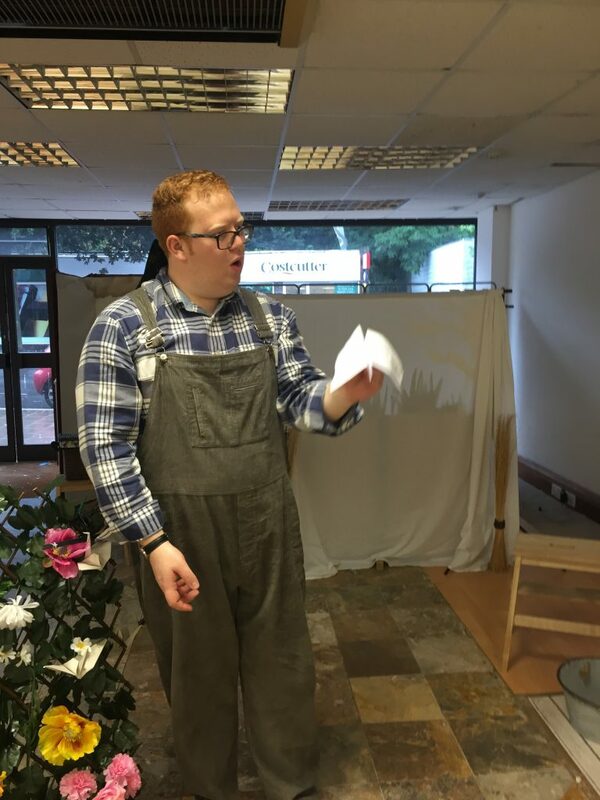 We spent a great deal of time devising the part of the story where the ‘ugly’ duck meets an old lady, played by George. Emily has written a lovely little song for this section, to accompany the scenes on stage. 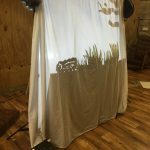 Something George and I have developed since previously visiting the piece is how to use shadow puppetry and live action to best effect. We are still experimenting with this but have found some lovely moments with the new puppets and addition of cellophane to add colour in different moments. We have will be finishing today with some script writing and puppet making, after a meal together of course. Hopefully there will be more videos tomorrow! We are back at the Farm! 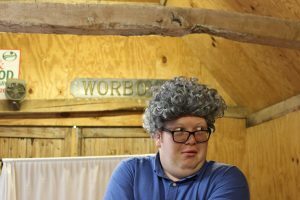 Yesterday we arrived at the Worboys Productions Theatre Farm Retreat to start week 1 of developing ‘The Ugly Duckling & Other Tales’. After a rather hot car journey in this glorious sunshine, we stopped off in Bury St Edmunds to pick up some last few bits to prepare for the week. Upon our arrival at the farm, we then set up the barn space and planned our week, looking at what we would do each day. 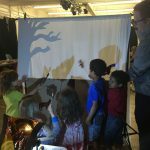 It was decided that today we would start to experiment with some of the puppets we have made, and also begin to make some new shadow puppets based on some of the ideas from our workshop at Brixington School. We started the morning developing a scene between the farm animals, discussing the appearance of the ‘Duckling’. This lead to us developing a clear distinction between rhyming speech and non-rhyming narration, something which we are thinking about for our narrator characters. In the afternoon, we cracked on with making our shadow puppets and have included some of the children’s designs (a house with an opening door). 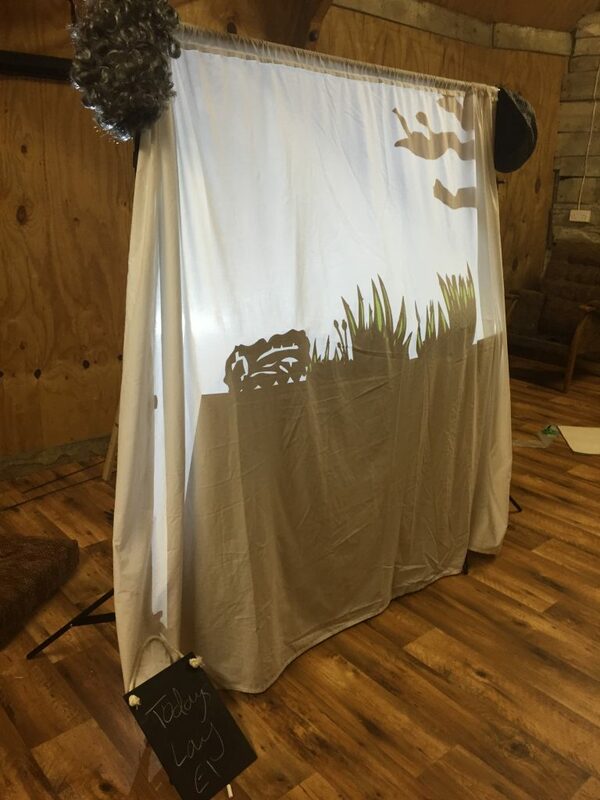 The main difference between our previous shadow puppets and our newly developed ones is that we have used coloured cellophane which makes for a more detailed and interesting puppet visually. We have made some scenery for some scene changes too, which we can’t wait to try tomorrow! Our musician Emily arrives tomorrow and we can’t wait to introduce her to our world. We are looking forward to experimenting with creating a soundscape for the piece, including some continuous sound, and hopefully, some of our trade mark catchy tunes! We’ll be posting every day, so pop back tomorrow for more updates on our process! On Thursday we’ll also be performing a work in progress showing at the Farm, so get in touch if you are in the South East and wild like to come along!